Volunteers are currently putting together an enormous Lite-Brite mural inside the Saint Paul Union Depot in an effort to break a Guinness World Record for Largest Picture Made by Lite-Brite. The work of art, titled “Forever Saint Paul,” was designed by Ta-coumba Aiken, a well known and respected artist in Lowertown. The project will launch the Forever Saint Paul Challenge, a $1 million grant for the best idea of making the city of Saint Paul greater than she already is. Anyone in the community is welcome to come to Union Depot until February 15 between the hours of 12:00-8:00 p.m. to help install lights into the mural. The official lighting ceremony is at 7:00 p.m. on February 16 at Union Depot. These volunteers and Lite-Brite pieces are day 33 of Photo 365. 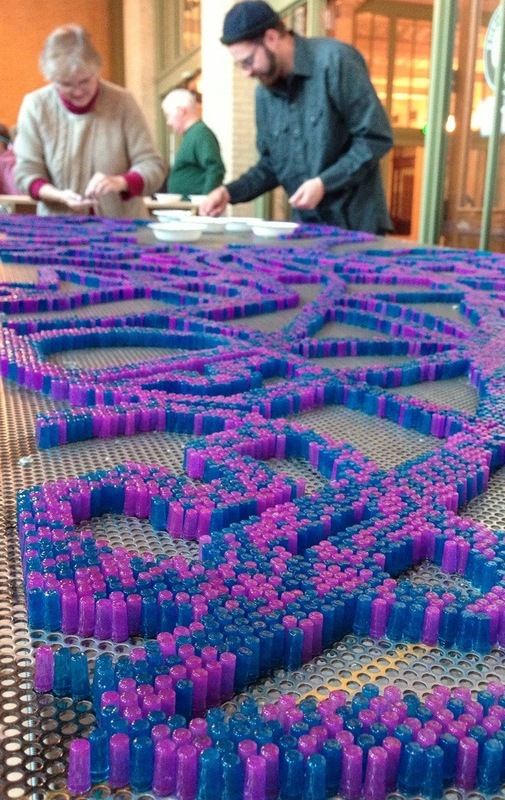 This entry was posted in Photography and tagged Lite-Brite, Photo 365, Saint Paul Union Depot. Bookmark the permalink.